Marianna is a PR friendly website. If you have a product that you would like me to review, would like to sponsor a giveaway on my blog or are interested in advertising opportunities then fill out the contact form below! A media kit is available upon request for my monthly statistics, review/giveaway policies and advertising rates. 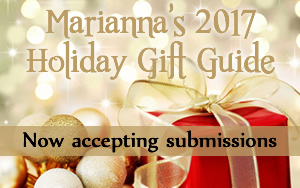 I am now accepting submissions for my 2017 Holiday Gift Guide. For more information please read my Holiday Gift Guide One Sheet.